Intravenous immunoglobulin (IVIg) products are available preparations of immunoglobulins extracted from plasma pools obtained from more than 1,000 healthy donors per lot. The inhibitory capacity of the IgGMA preparation was more potent than the capacity of an IVIgG preparation. IgM-enriched IVIg used in different cases of severe sepsis and polyneuromyopathy but the effectiveness was not the same. Although IgM-enriched IVIg has some adverse effect on the kidney. Immunoglobulins, also known as antibodies, are glycoprotein molecules belonging to the immunoglobulin super family . They have an important role in the human body's immune system and are generated mainly in differentiated B cells called plasma cells in response to an immunogen. Immunoglobulins attach to foreign pathogens, such as bacteria and help in destroying or neutralizing them . Immunoglobulin is abbreviated Ig. The classes of immunoglobulins are termed immunoglobulin A (IgA), immunoglobulin G (IgG), immunoglobulin M (IgM), immunoglobulin D (IgD) and immunoglobulin E (IgE) . Even though different immunoglobulins can differ structurally, they all have a four-chain structure as their basic unit. They are composed of two identical light (L) chains (23 kD) and two identical heavy (H) chains (50-70 kD). The H and L chains and the two H chains are held together by non-covalent interactions and inter-chain disulfide bonds. There are also intrachain disulfide bonds within each of the polypeptide chains . Both the H and L chains can be divided into two regions based on variability in the amino acid sequences. These regions are named domains. L chain domains are called VL (V: variable; 110 amino acids) and CL (C: constant; 110 amino acids) and H chain domains are named VH (110 amino acids) and CH (330-440 amino acids). The hinge region is the region at which the arms of the immunoglobulin molecule form a Y. It is called the hinge region since there is some flexibility in the molecule at this point . Immunoglobulins, which are considered as a population of molecules, are commonly very heterogeneous because they consist of various classes (isotypes) and subclasses. Each of the classes or subclasses has various types and subtypes of light chains. Different immunoglobulins can have different antigen binding abilities because of their different VH and VL regions. Besides, based on the differences in the amino acid sequences in the constant region of the heavy chains, the immunoglobulins can be divided into five distinct classes including IgG, IgA, IgM, IgE and IgD. These differences can be found by sequence studies or more routinely by serological methods for example by the use of antibodies directed to these varieties. Overall, all immunoglobulins within a given class will own very similar heavy chain constant regions . Immunoglobins comprised of two regions: the variable region recognizes changing antigens and the constant region binds to complement proteins and reticuloendothelial system receptor . The structure of immunoglobulins has made them suitable for their defensive role. IgG is the most versatile immunoglobulin because it can carry out different functions of immunoglobulin molecules. All IgG's subclasses are monomers . The structures of the IgG subclasses are presented in Figure 1. IgM routinely exists as a pentamer as well as a monomer. In the pentameric pattern, all light chains are identical and all heavy chains are similar. Therefore, the valence is theoretically 10. 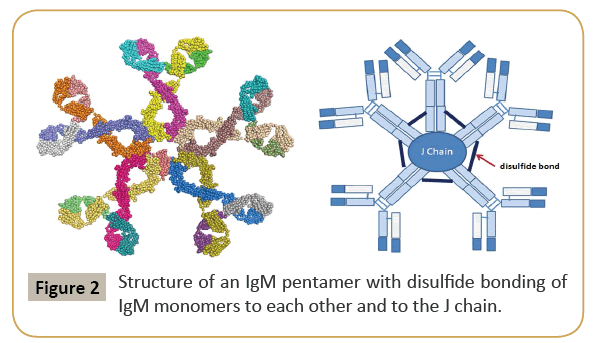 IgM has an extra domain on the CH4 and it has another protein covalently bound through a disulfide bond named the J chain. This chain functions in the polymerization of the molecule into a pentamer . The structure of IgM is presented in Figure 2. IgA found in serum is a monomer but secretions IgA is a dimer. A J chain is associated with secretions IgA. Moreover, another protein named the secretory piece or T piece is associated with secretions IgA. All parts of the IgA are made in the plasma cell, but the secretory piece is built in epithelial cells and added to the IgA as it passes into the secretions. The secretory piece protects IgA from degradation in the secretions and aids IgA to be transported across mucosa . The structures of the secretions IgA are presented in Figure 3. Figure 1: Structure of IgG with disulfide bondings between the Ig heavy chains. Figure 2: Structure of an IgM pentamer with disulfide bonding of IgM monomers to each other and to the J chain. 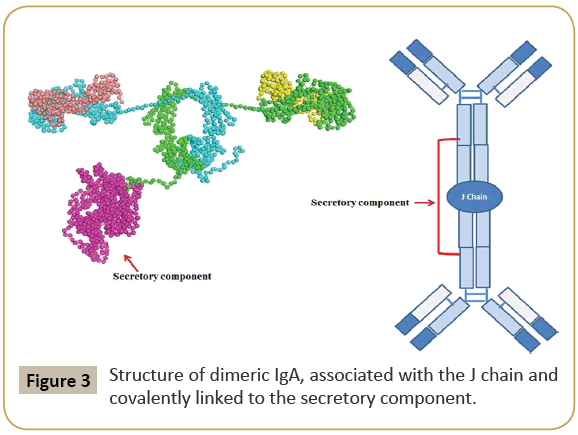 Figure 3: Structure of dimeric IgA, associated with the J chain and covalently linked to the secretory component. Intravenous immunoglobulin (IVIg) products are available preparations of immunoglobulins extracted from plasma pools obtained from more than 1,000 healthy donors per lot. IVIG consists of at least 90%. IgG has four subclasses: IgG1, IgG2, IgG3 and IgG4. IgG1 as the major component of IVIG preparations plays a key role in tissue protection, complement activation, virus inactivation and susceptibility of bacterial cells to phagocytosis . The activated complement and released inflammatory factors such as TNFα, IL-6 and IL-8 are important pathogenic factors explaining organ dysfunction in sepsis. Patients receiving IVIgG infusion twice or more are less likely to suffer from frequent or longer infection episodes. One of the effects of IVIgG may be the induction of anti-inflammatory cytokines or cytokines antagonists . In mixed lymphocyte reaction (MLR) experiments conducted by Schroeder and Cavacini , the effect of preparation containing IgM, G and A (Pentaglobin) on the immunomodulatory capacity of IVIG was investigated. The study reported a significant inhibition of alloantigen-induced proliferation. The inhibitory capacity of the IgGMA preparation was more potent than the capacity of an IVIgG preparation. Analyzing cytokines in the culture supernatants showed that modulations of IL-2 and IFNÃÂ£ production with a subsequent impact on TNFα and IL-6 release have occurred . In a study conducted by Wand and his colleagues, 26 patients with severe sepsis or septic shock were treated with IgM-enriched immunoglobulin (Pentaglobin) and the results showed a significant reduction in the level of endotoxin activity. Moreover, both the platelet count and fibrinogen concentrations were higher in the IgM-IVIg group than in the control group. Viscoelastic or aggregometry measurements and inflammatory markers including LBP levels, IL-6 levels and leucocyte counts were not influenced by the treatment . The original IVIG product, which was officially approved in 1981, did not contain stabilizers. Adverse side effects associated with the IVIG formulations were fever, chills, fatigue and chest, hip, joint and back pain. These effects were thought to be due to the formation of immunoglobulin aggregates. Therefore, in an effort to reduce adverse effects, stabilizers were added to IVIG formulations to decrease the aggregation of immune complexes. The added stabilizers are mainly sugars such as sucrose, maltose, glucose and sorbitol as well as amino acids such as glycine and albumin . Unfortunately, these stabilizers may be implicated in the development of adverse renal events, including nonspecific acute renal failure, renal dysfunction and osmotic nephrosis. The proposed mechanism of adverse renal effects is believed to be hyper osmolality caused by the stabilizers. Renal tubular injury occurs when sucrose, a large carbohydrate molecule, is taken up by tubular epithelial cells in the process of pinocytosis. This incorporation of sucrose into lysosomes causes swelling of the epithelial cells and cytoplasmic vacuolization of the tubules, especially in the proximal tubules. The swelling and vacuolization cause narrowing of the tubular lumina, leading to injury and degeneration of the proximal tubular epithelium . Sucrose as an IVIG stabilizer is mainly associated with adverse renal events, perhaps because sucrose has the highest osmotic activity of the stabilizers used in IVIG products. Moreover, sucrose is only metabolized by sucrose enzyme in the intestine, while other stabilizers are metabolized by the liver. Since IVIG products are administered intravenously, sucrose cannot be metabolized to glucose and fructose in the intestine. Sucrose is removed unchanged in the urine, likely causing osmotic nephrosis . Chapman et al. reported two cases of acute renal failure following the administration of sucrose-stabilized IVIG (Panglobulin). Renal function returned to baseline after 11 days in one patient and 10 days in the other patient. In one case, acute renal failure did not recur after the patient received additional doses of a sorbitol-stabilized formulation (Venoglobulin-S). The other patient did not receive additional doses of IVIG. This report suggested that sucrose-stabilized IVIG products may be more likely than sorbitol-stabilized IVIG products to result in acute renal failure. In another report, Itkin and Trujillo  reported acute renal failure in four patients who received IVIG containing sucrose (Panglobulin). In each patient, renal function returned to baseline after therapy was discontinued. IVIG therapy with a nonsucrose-containing product (Polygam S/D) was continued in one patient, who experienced no further renal complications. The investigators also addressed formulary restrictions with IVIG. Panglobulin is the preferred IVIG product, regardless of renal failure risk and Polygam S/D is considered only for patients who have developed acute renal failure and cannot tolerate Panglobulin therapy after further dilution of the drug and/or a decrease in infusion rate. Therefore, products with lower osmolality or nonsucrose stabilizers may be preferred in patients with renal insufficiency; however, no direct comparison of the incidence of renal failure between IVIG products or specific stabilizers has been documented in the literature . Dysregulated host response to infection leads to an inflammatory condition called sepsis. Sepsis has a wide spectrum ranging from mild features of systemic inflammation to severe sepsis. Septic shock as a serious condition may lead to poor organ function. The expression of FcÃÂ£Rs on innate and adaptive immune cells increases by a bacterial infection. Immunoglobulins modulate the innate and adaptive immune activity by changing the balance between immunoreceptor tyrosin-based activating motif (ITAM) and immunoreceptor tyrosin-based inhibitory motif (ITIM) in the FcÃÂ£Rs. Following the binding of immunoglobulins, all FcÃÂ£Rs except FcÃÂ£RIIB are stimulated and activate immune cells. The activation is related to the aggregation of ITAM cytoplasmic domain which leads to phosphorylation of ITAM tyrosines and activation of downstream cell signalling pathways. By contrast, FcÃÂ£RIIB is related to the ITIM cytoplasmic domain with phosphorylation of tyrosines in ITIMs leading to attenuation of the activity of cell signalling pathways . It is demonstrated that changing the balance between ITAM and ITIM activity via immunoglobulins may be influenced by IVIg therapy . Staphylococci and Streptococci release super antigens that activate T-cells. IVIg preparations contain IgG against super antigens that inhibit their T-cell and monocyte activation. IVIg with IgM-enriched preparations contains antibodies against lipopolysaccharides of Escherichia coli, Pseudomonas aeruginosa and Klebsiella spp. . In a RCT study on 42 patients with severe sepsis, 21 patients received IgM and IgA enriched IgG preparation (Pentaglobin®) in addition to standard sepsis therapy. Though the study found that procalcitonin (PCT) levels significantly declined, the treatment was not successful . In another case study, a 21 years old woman with a history of abdominal pain, diarrhea, nausea and vomiting after swimming in dirty water were treated for her septic shock. No improvement was observed in treatment with antibiotics, fluid resuscitation, ventilator therapy and her condition was worsened. However, after administrating IgM-enriched immunoglobulin (Pentaglobin – Biotest, Dreieich, Germany) for five days, a significant improvement was achieved . In a meta-analysis, an overall reduction in the mortality rate of severe sepsis and septic shock in adults who received IVIg as the adjunctive treatment was reported. In comparison to placebo, the effect of IVIg appeared to be more pronounced when larger doses of IVIg (1 g/kg) were received . In another study, a group of patients who were affected by sepsis after cardiac surgery were treated with the polyclonal IgMenriched immunoglobulins (Pentaglobin; Biotest AG, Dreieich, Germany). The results showed no significant reduction in the mortality rate of the study population. However, the treatment could improve the survival rate of the subgroup of patients with severe sepsis significantly . Critical illness polyneuromyopathy (CIPNM) as a complication in critically ill patients leads to weakening of the muscles. In a randomized, double-blinded and placebo-controlled trial, IVIg did not alleviate CIPNM. The electrophysiology stimulation of three nerves and biopsy of muscle showed no differences between IVIg group and the control group. The treatment also failed to influence the length of ICU stay and mortality rate of either group . In conclusion, there were different results about the effectiveness of IgM-enriched immunoglobulin in different cases and further researches might be needed. However, this is a subject that has already been studied and so far has not reported considerable improvement in the evolution of septic shock with use of immunoglobulin. Therefore it is interesting to review this subject deeply and expose the reasons. Farhadi T, Hashemian SMR (2017) Constructing novel chimeric DNA vaccine against Salmonella enterica based on SopB and GroEL proteins: An in silico approach. J Pharm Investig 47: 453-460. Farhadi T, Nezafat N, Ghasemi Y, Karimi Z, Hemmati S, et al. (2015) Designing of complex multi-epitope peptide vaccine based on Omps of Klebsiella pneumoniae: An in silico approach. Int J Pept Res Ther 21: 325-341. Maverakis E, Kim K, Shimoda M, Gershwin ME, Patel F, et al. (2015) Glycans in the immune system and the altered glycan theory of autoimmunity: A critical review. J Autoimmun 57: 1-13. Charles Janeway (2001) Immunobiology. 5th edn. Garland Publishing, USA. Woof J, Burton D (2004) Human antibody-Fc receptor interactions illuminated by crystal structures. Nat Rev Immunol 4: 89-99. Schroeder JHW, Cavacini L (2010) Structure and function of immunoglobulins. J Allergy Clin Immunol 125: S41-S52. Lundqvist ML, Middleton DL, Radford C, Warr GW, Magor KE (2006) Immunoglobulins of the non-galliform birds: Antibody expression and repertoire in the duck. Dev Comp Immunol 30: 93-100. Stavnezer J, Amemiya CT (2004) Evolution of isotype switching. Semin Immunol 16: 257-275. Tomasi TB (1992) The discovery of secretory IgA and the mucosal immune system. Immunol Today 13: 416-418. Williams AK, Ward LG, Bhatt VK (2010) IVIG use in renal insufficiency or transplantation US pharm. 35: HS19-HS25. Wand S, Klages M, Kirbach C, Warszawska J, Meybohm P, et al. (2016) IgM enriched immunoglobulin attenuates systemic endotoxin activity in early severe sepsis: A before-after cohort study. PLoS ONE 11: e0160907. Orbach H, Tishler M, Shoenfeld Y (2004) Intravenous immunoglobulin and the kidney - A two-edged sword. Semin Arthritis Rheum 34: 593-601. Chapman SA, Gilkerson KL, Davin TD, Pritzker MR (2004) Acute renal failure and intravenous immune globulin: Occurs with sucrose-stabilized, but not with d-sorbitol–stabilized, formulation. Ann Pharmacother 38: 2059-2067. Itkin YM, Trujillo TC (2005) Intravenous immunoglobulin-associated acute renal failure: Case series and literature review. Pharmacotherapy 25: 886-892. 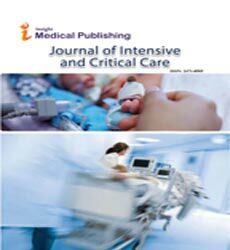 Shankar-Hari M, Spencer J, Sewell WA, Rowan KM, Singer M (2012) Bench-to-bedside review: Immunoglobulin therapy for sepsis - Biological plausibility from a critical care perspective. Crit Care 16: 206. Espeli M, Niederer HA, Traherne JA, Trowsdale J, Smith KG (2010) Genetic variation, FcÎ³ receptors, KIRs and infection: The evolution of autoimmunity. Curr Opin Immunol 22: 715-722. Tugrul S, Ozcan PE, Akinci O, Seyhun Y, Cagatay A, et al. (2002) The effects of IgM-enriched immunoglobulin preparations in patients with severe sepsis. Crit Care 6: 357-362. Wieczorek A, Gaszynski T (2015) Successful treatment of septic shock with the use of IgM enriched immunoglobulin solution and antibiotic policy. Austin J Emerg Crit Care Med 2: 1014. Laupland KB, Kirkpatrick AW, Delaney A (2007) Polyclonal intravenous immunoglobulin for the treatment of severe sepsis and septic shock in critically ill adults: A systematic review and meta-analysis. Crit Care Med 35: 2686-2692. Buda S, Riefolo A, Biscione R, Goretti E, Cattabriga I, et al. (2005) Clinical experience with polyclonal IgM-enriched immunoglobulins in a group of patients affected by sepsis after cardiac surgery. J Cardiothorac Vasc Anesth 19: 440-445. Brunner R, Rinner W, Haberler C, Kitzberger R, Sycha T, et al. (2013) Early treatment with IgM-enriched intravenous immunoglobulin does not mitigate critical illness polyneuropathy and/or myopathy in patients with multiple organ failure and SIRS/sepsis: A prospective, randomized, placebo-controlled, double-blinded trial. Crit Care 17: R213.